The SmartMount Flat Wall Mount series offers the most versatile installation features and mounting options. Peerless SF632(P) models low-profile design offers the sleek, aesthetically pleasing look to fit into any décor. Security screws provided in peerless SF632 model deter tampering and theft. The display can now simply be installed by a single person with the Hook-and-Hang system. 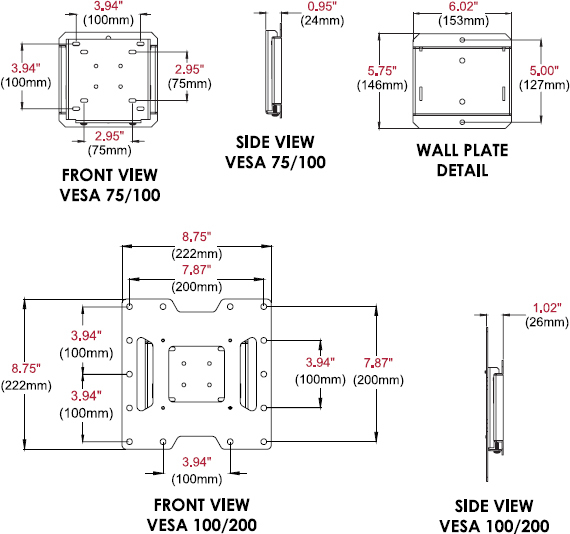 The Easy-Glide adaptors hook onto the wall plate for an overall quick, simple, and secure installation. Helpful Hints: The SF632’s design positions the display just 1.02" from the wall, perfect for almost any low-profile application.